The sun rises, the sun sets, the tide ebbs and flows. Apple continues to improve the design of its products, people continue to get mad about it. The “anger of the week” regards rumors that Apple is going to remove the 1/8″ headphone jack from the iPhone 7, you know, the technology that was invented for transistor radios. This particular petition seems to know its audience well, and brings up the specter of “environmental waste” to stoke further anger, and even reminds the reader of the last “outrageous” thing Apple did: replace the monstrous 30-pin connector with the petite Lightning port. 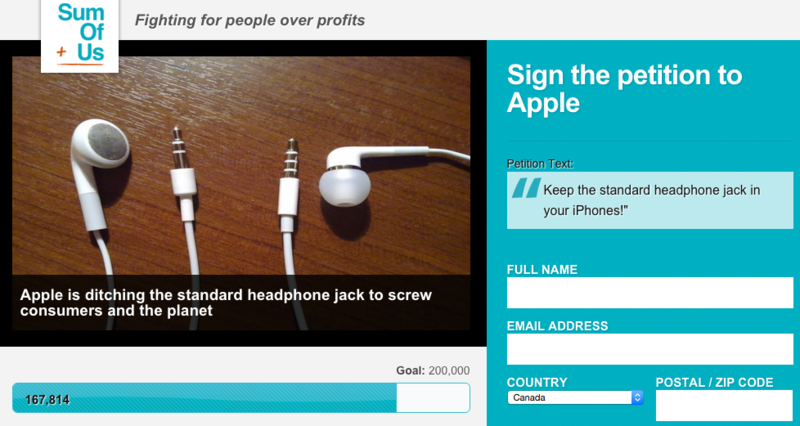 This petition is just the latest in a very long line of stupid petitions addressed to Apple. The first one I can remember is Apple’s removal of the floppy drive from the iMac – people were pissed. “Apple is trying to force us to buy SuperDrives, what a bunch of profiteering gluttons!” Next Apple removed the SuperDrive from the MacBook – people were pissed, but their MacBooks were mysteriously thinner and lighter. Next, Apple changed its MagSafe power adapter because the MacBook Air is literally thinner than the original MagSafe adapter, but still, people were pissed. The newest MacBook only has one USB-C port. If you’ve ever picked one up you’ll see why – there is physically no room for anything else, and that thing weighs less than books I’ve read. This newest fury seems to be coupled with the bizarre notion that Apple “only did this to sell us $30 Lightning headphone adapters.” For one thing, nobody knows how much the adapters will cost, if this rumor is even true. [Update: the adapters are $9, now the cheapest items Apple sells] Secondly, whomever thinks this is Apple’s “evil plan” knows literally nothing about business. The profit margin on an iPhone 6 is 69%. Sixty-nine-goddamn-percent, and Apple has already sold 100 million of them. How much could you really make on a Lightning headphone adapter? How many of them could you really sell? Apple must be raking it in with these USB SuperDrives – they’re 100 bucks! Apple doesn’t want to sell you a $30 Lightning adapter – they want to sell you a $700 phone. Millions of them. Partly by making them thinner than the next Samsung phone, which can never be thinner than 3.5mm until they ditch the headphone jack too. (Spoiler alert: they will.) Making a phone the thinnest and lightest it can possibly be means removing physical barriers. Now, it is time for the iPhone to become thinner than the 3.5mm headphone jack. Sure, Apple owns a headphones company, but you don’t have to buy any from them. You can use literally any Bluetooth headphones you want. If you remember the fury about the iPhone never supporting flash apps, Steve Jobs had a classic response: make an iPhone app, or use HTML5. In the future, cables will not exist, not even for charging. For those of you who can’t let go, there is the adapter. For the rest of us, the future is here.